The tape bore a label indicating it was made on November 9. Administration officials wouldn't reveal exactly how or when they got it, except to say it was found in a house in Jalalabad after anti-Taliban forces moved in. The size of a standard VHS videotape is 7.5 inches wide by 4.2 inches deep by 1 inch high - if you look in a video cabinet you'll see they're not very big. 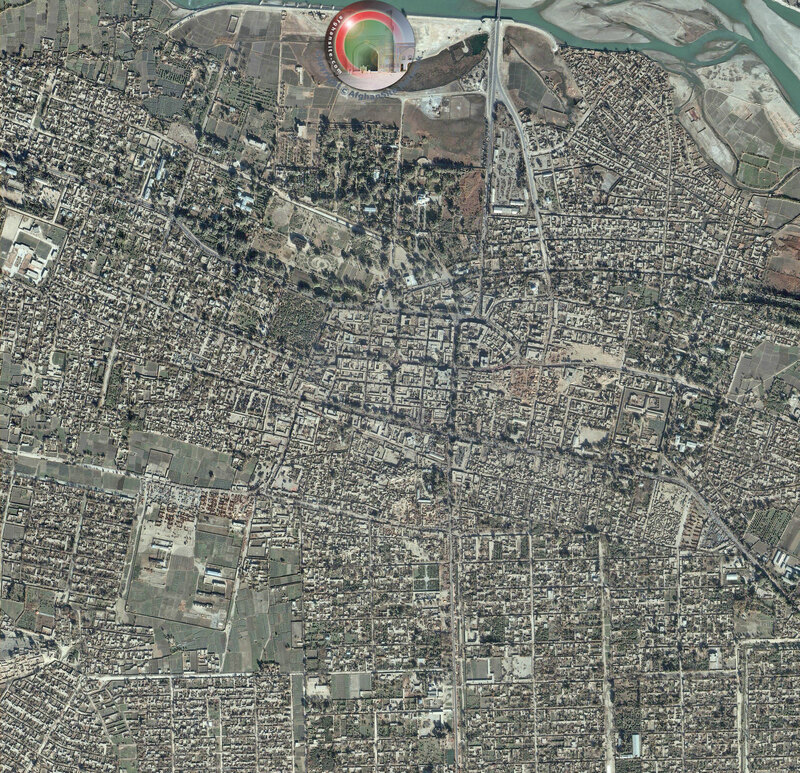 The satellite photograph on the right shows Jalalabad - it is very big and it contains a lot of buildings (not all single storey). "For those who see this tape, they'll realize that not only is he guilty of incredible murder, he has no conscience and no soul, that he represents the worst of civilization," said President George W Bush. US Senator Ron Wyden, who has also seen the tape, says he hopes it will remove suspicions in countries such as Pakistan that the 11 September attacks were an Israeli plot aimed at drawing the US into a war with Islamic countries. Details of the videotape - includes full video and transcript. See below section. A German TV show found that the White House's translation of the video was inaccurate and "manipulative". Bin Laden even praised two live 'hijackers' - Wail M. Alshehri and Salem Alhazmi. Why didn't he know the names of hijackers he personally chose? "It is preposterous for anybody to think that this tape is doctored," he said during a brief photo opportunity with the prime minister of Thailand. "That's just a feeble excuse to provide weak support for an incredibly evil man." To be perfectly honest it is preposterous to suggest this videotape could be authentic, but lets have a look at it anyway. Here's 5 Osamas - which is the odd one out? The "Gaunt Tape," so named because bin Laden is haggard and doesn't move his left arm, is believed to have been recorded around Nov. 19, 2001. In the tape, bin Laden refers to the U.S. bombing of a mosque in Khost "several days" earlier. The recording was dismissed by the Bush administration ... as sick propaganda possibly designed to mask the fact the al-Qa'eda leader was already dead. "He could have made the video and then ordered that it be released in the event of his death," said one White House aide. American officials argued that bin Laden's frequent references to US support for Israel were a bogus justification for his terrorism because in the "dinner party" tape of a private conversation there was no mention of the Middle East. This system is totally in control of the American-Jews, whose first priority is Israel, not the United States. It is clear that the American people are themselves the slaves of the Jews and are forced to live according to the principles and laws laid by them. So, the punishment should reach Israel. In fact, it is Israel, which is giving a blood bath to innocent Muslims and the U.S. is not uttering a single word. "We say to the Americans as people and to American mothers, if they cherish their lives and if they cherish their sons, they must elect an American patriotic government that caters to their interests, not the interests of the Jews." But there are very good reasons to suspect that the tape is not what the US Government claims it to be. In the tape, Osama supposedly states that he knew of the attack on the WTC 5 days in advance, yet we know from the preparations inside the United States that the plan had been in existence for much longer than that. The records of those flight schools where the hijackers supposedly trained have been confiscated under the watchful eye of Jeb Bush, Governor of Florida and brother to the President. Will the Bush administration now claim that the hijackers learned to fly a passenger jet in just 5 days? Emergency powers to imprison suspected international terrorists indefinitely using special closed courts will be announced this week. The measure, which will require exemption from human rights legislation, will be used to round up about 20 suspects hiding in Britain beyond the reach of existing laws. Even hard line secular Pakistanis were unconvinced by the released bin Laden video tape. Iqbal Haider, a former senator from the party of ousted prime minister Benazir Bhutto, said he found it hard to believe that bin Laden would allow himself to be filmed confessing to the crime. "It is hard to believe that a man who masterminds the September attacks with such secrecy and finesse could be that stupid and imprudent," he said. "I hate Osama and the Taliban because they inflicted incalculable damage on Muslims... but it is hard to digest that he can be such a fool." Ray Suarez reports on a video tape, released by the Pentagon, which the Bush administration says clearly proves Osama bin Laden masterminded the Sept. 11th attacks. A most chilling videotape was made public today. The pentagon released a tape of Osama bin Laden discussing the successful attacks of September 11. Administration officials said it makes clear that bin Laden was the mastermind behind the operation. Ray Suarez begins our report. The U.S. Government translated the Arabic conversation and provided subtitles. The tape, which has a home video quality, shows bin Laden sitting on the floor in a bare room in a house in Kandahar. With him are several other men, including two aides and an unidentified cleric, or Sheikh. Bin Laden, identified on screen as UBL, made it clear he planned the September 11 attacks. "We calculated in advance the number of casualties from the enemy who would be killed based on the position of the tower. We calculated that the floors that would be hit would be three or four floors. I was the most optimistic of them all. Due to my experience in this field I was thinking that the fire from the gas in the plane would melt the iron structure of the building and collapse the area where the plane hit and all the floors above it only." (Translated) "This is all that we had hoped for." The Sheikh replies, "Allah be praised." "We were at - (inaudible…) -- when the event took place, we had notification since the previous Thursday that the event would take place that day. We had finished our work that day and had the radio on." (Translated) "It was 5:30 PM our time. I was sitting with Dr. Ahmed Abu-al-Khair. Immediately, we heard the news that a plane had hit the World Trade Center. We turned the radio station to the news from Washington. The news continued and no mention of the attack until the end. At the end of the newscast, they reported that a plane just hit the World Trade Center." Again, the Sheikh replies: "Allah be praised." "After a little while they announced that another plane had hit the World Trade Center." "The brothers who heard the news were overjoyed by it." "I listened to the news and I was sitting. We didn't - we were not thinking about anything, and all of a sudden, Allah willing, we were talking about how come we didn't have anything, and all of a sudden the news came and everyone was overjoyed, and everyone, until the next day in the morning was talking about what was happening. And we stayed until 4 o'clock listening to the news, every time a little bit different. Everyone was very joyous and saying, 'Allah is great. Allah is great. We are thankful to Allah. Praise Allah.'" "And I was happy for the happiness of my brothers. That day the congratulations were coming on the phone non-stop." (Translated) "The mother was receiving phone calls continuously, 'Thank Allah. Allah is great.'" An aide to bin Laden, identified as Sulayman or Abu Guaith, expressed joy at learning of the attacks. "I was sitting with the Sheikh in a room. Then I left to go to another room where there was a TV set. The TV broadcasted the big event. The scene was showing an Egyptian family sitting in a living room. They exploded with joy. You know when there's a soccer game and your team wins; it was the same expression of joy. There was a subtitle that read 'In revenge for the children of Al Aqsa: Osama bin Laden executes an operation against America,' so when I went back to the Sheikh," meaning Osama bin Laden, "who was sitting in a room with fifty to sixty people, I tried to tell him about what I saw, but he made a gesture with his hands, meaning, I know, I know." "He did not know about the operation. Not everybody knew. Muhammad," that is, Attah, "from the Egyptian family" meaning the Al-Qaida Egyptian group - "was in charge of the group." "A plane crashing into a tall building is out of anyone's imagination. This was a great job. He was one of the pious men in the organization. He became a martyr. Allah bless his soul." "But they were trained and we did not reveal the operation to them until they are there, just before they boarded the planes." "And the difference between the first plane and the plane that hit the Pentagon was one hour." The Sheikh responds: "They" - that is the Americans - "were terrified, thinking there was a coup." At the beginning of the meeting, the cleric thanked bin Laden for the operation and said it was a great success. And bin Laden said the attacks helped recruit followers. "This event made people think about true Islam, which benefited Islam greatly." The tape, which was about an hour long, included other footage besides the meeting. Bin Laden's forces are seen at the site where a U.S. helicopter crashed in southern Afghanistan in October. They displayed various parts of the aircraft for the camera. At the Pentagon today, Defense Secretary Donald Rumsfeld said the tape provided insights into bin Laden and his actions. Donald Rumsfeld: I suppose one can come away from looking at not just this tape, but his general behavior over time, he clearly has a large network. He clearly has a well-financed network. It covers many, many countries across the globe. He's a careful planner. They also are clearly able to put things in compartments and let only certain people know certain things. He's also perfectly willing to do almost anything anyone can imagine to kill people. Do I expect that he has other plans? Sure. Do I expect that he has places he thinks he might be able to go, someplace other than where he is if that becomes uncomfortable?